The Harrier Jump Jet, often referred to as just "Harrier" or "the Jump Jet", is a military jet aircraft capable of Vertical/Short Takeoff and Landing (V/STOL) via thrust vectoring. The Harrier family is the only truly successful design of this type from the many that arose in the 1960s. There are four main versions of the Harrier Jump Jet. Hawker Siddeley Harrier - 1st generation Harrier, also known as the AV-8A Harrier. British Aerospace Sea Harrier - Maritime strike/air defence fighter aircraft based on the original Harrier. Boeing/BAE Systems AV-8B Harrier II - 2nd generation Harrier. BAE Systems/Boeing Harrier II - British variant of the 2nd generation Harrier. 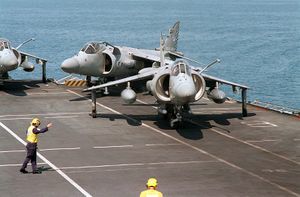 The Harrier was extensively redeveloped by McDonnell Douglas and British Aerospace, leading to the AV-8B Harrier II and Harrier GR5/GR7/GR9, respectively. Both were built by companies that are now parts of Boeing and BAE Systems. The British Aerospace Sea Harrier is a naval VTOL/STOVL jet fighter, reconnaissance and attack aircraft, a development of the Hawker Siddeley Harrier. The first version entered service with the Royal Navy's Fleet Air Arm in April 1980 as the Sea Harrier FRS.1, and was informally known as the Shar. The upgraded Sea Harrier FA2 entered service in 1993. It was withdrawn from Royal Navy service in March 2006. The Sea Harrier FRS Mk.51 is in active service with the Indian Navy, which operates the jet from its aircraft carrier INS Viraat. The Boeing/BAE Systems AV-8B Harrier II is a family of second-generation V/STOL jet multi-role aircraft of the late 20th century. Developed from the earlier Hawker Siddeley Harrier, it is primarily used for light attack or multi-role tasks, typically operated from small aircraft carriers. Versions are used by several NATO countries, including Spain, Italy, and the United States. The BAE Systems/Boeing Harrier II is a second generation V/STOL aircraft used by the Royal Air Force (RAF) and, since 2006, the Royal Navy. It was developed from the earlier Hawker Siddeley Harrier and is very closely related to the US built AV-8B Harrier II. Both are primarily used for light attack or multi-role tasks, and are often operated from small aircraft carriers. Following an approach by the Bristol Engine Company in 1957 that they were planning a directed thrust engine, Hawker Aircraft came up with a design for a plane that could meet the current NATO specification for a "Light Tactical Support Fighter". There was no financial support for the development from HM Treasury, but aid was found through the Mutual Weapon Development Project (MWDP) of NATO. Work on the P.1127 continued with 9 evaluation aircraft, the Hawker Siddeley Kestrel, ordered. These started flying in 1964 and were assessed by the "Tri-partite Evaluation Squadron" which consisted of British, US and German pilots. 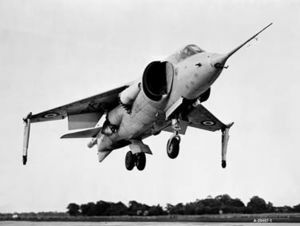 With the cancellation of the P.1154, the RAF ordered a modified P.1127/Kestrel as the Harrier GR.1 in 1966. While the Harrier is one of the most flexible aircraft ever made, the level of understanding and skill needed to pilot it is considerable. 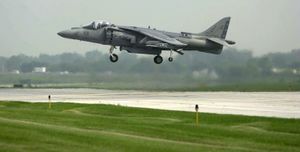 The Harrier is capable of both forward flight (where it behaves in the manner of a typical fixed-wing aircraft above its stall speed), and VTOL and STOL maneuvers (where the traditional lift and control surfaces are useless). This requires skills and understanding more usually associated with helicopters. Most services demand great aptitude and extensive training for Harrier pilots, as well as experience of piloting both types of aircraft. Many recruit trainee pilots from the most experienced and skilled helicopter pilots in their organisations. The Harrier has two control elements that a fixed-wing aircraft does not usually have. These are the thrust vector and reaction control system. 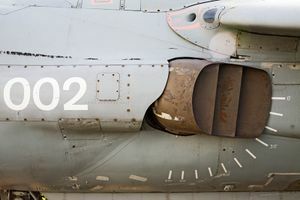 The thrust vector refers to the slant of the four engine nozzles and can be set between zero degrees (horizontal, pointing directly back) and 98 degrees (pointing down and slightly forwards). The 90 degree place is generally used for VTOL maneuvering. Thrust vector is adjusted by a control next to the thrust lever. The reaction control is achieved by manipulating the control stick and is similar in action to the cyclic control of a helicopter. While irrelevant during forward flight mode, these controls are essential during VTOL and STOL, and are used together during these maneuvers. Wind direction and the point of reference of the aircraft to this is also crucial during VTOL maneuvers (in this sense operation is limited compared with a helicopter, which can take off and land in side winds). 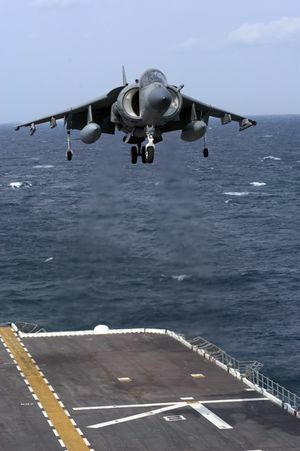 The Harrier's landing gear configuration also complicates normal landing; it is necessary to ensure that the wing-mounted stabiliser struts contact the runway simultaneously; bounce or tilt to one side can result if this is not achieved. The procedure for VTO involves parking the aircraft facing into the wind. The aircraft is brought to a halt, throttle to idle, wheels locked. The thrust vector is set to 90 degrees and the throttle brought up to maximum. The aircraft leaves the ground rapidly. The throttle is trimmed until a hover state is achieved at the desired altitude. During the ascent and hover, the reaction control system is continuously adjusted to maintain position over the patch of ground, much as it is with a helicopter. The aircraft has to face into the wind when taking off in this way. A side wind causes the aircraft to pitch away from the lee side. This would alter the thrust vector away from vertical and cause the aircraft to slew sideways. This is hard to control and dangerous. In severe cases the aircraft can settle with power while moving to the side. While taking off in windy conditions is always more difficult when within ground effect, it is easier to maintain heading away from the ground effect as the tailplane tends to stabilise the heading into the wind. At hover, the thrust vector is slowly returned to horizontal while the altitude and angle of attack is maintained in a specified range. At or shortly after normal take off speed, the thrust vector is set to horizontal and thrust is usually trimmed back to control acceleration. The STO procedure involves proceeding with normal take off and then applying a thrust vector (less than 90 degrees) at a runway speed below normal take off speed. For lower take off speeds, the thrust vector applied is greater. The vector and thrust is then trimmed until take off speed. Several procedures have been described for different runway lengths. The technique of VIFFing ("Vectoring In Forward Flight"), i.e. rotating the vectored thrust nozzles into a forward-facing position during normal flight, was developed as a dog-fighting tactic for both (a) higher turns rates than would normally be possible for an aircraft with such a short wing-span and (b) sudden braking. The latter causes a chasing aircraft to overshoot and present itself as a target for e.g. air-to-air missiles. Because VIFFing reduces forward thrust, acceleration and manoeuvers in the vertical plane are hampered by thrust vectoring, where thrust-to-weight is more necessary than low wing loading. The Harrier family's unique characteristics have led to them being featured in a number of films and flight simulator programs. The jet appears in the James Bond movie The Living Daylights, in the science fiction film Battlefield Earth, and in the film True Lies, in which Arnold Schwarzenegger flies an AV-8B. According to the Internet Movie Database, while making True Lies, the filmmakers paid the U.S. government $100,736 (or about $2,400 an hour) for the use of three US Marine Corps Harriers and their pilots. As part of its 1996 Pepsi Stuff marketing campaign, Pepsi ran an ad promising a Harrier jet to anyone who collected 7,000,000 Pepsi Points. This ploy backfired when a group of investors actually collected and sent in the requisite points. A lawsuit ensued (Leonard v. Pepsico, Inc.), where it was ruled that any reasonable person would conclude that the ad was a joke. ↑ Norden, Lon O. Harrier II, Validating V/STOL. Annapolis: Naval Institute Press, 2006. ISBN 1-59114-536-8. Cowan, Ed Charles W. (1972). Flypast 2. Profile Publications Ltd, Berkshire, Windsor, England. ISBN 0-85383-191-2. This page was last edited on 19 February 2008, at 13:15.